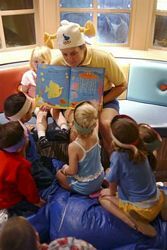 It's not an official port of call, but children ages 3 to 7 may feel like they've left the ship and arrived at Peter Pan's Never Land during their stay at the whimsical Oceaneer Club. This child-friendly oasis, themed to Captain Hook's pirate ship, contains a play area with slide and rope bridge, a "captain's closet" filled with costumes, toys and games, and an open seating area for arts, crafts and movie watching. Counselors keep tots entertained with activities ranging from dance parties to science experiments to interactive story time. A special moment with a Disney princess comes to life when children share a dance with Snow White at Do Si Do With Snow White. Sebastian's Musical Sea Search is a hunt for instruments; once they're found, everyone has a place in the band for a big concert! Cool down on Castaway Cay with Water Mania, a splashy selection of games involving water balloons, sponges, buckets and lots of water. Children can make a magical green goo and other interesting creations during Professor Goo's Magical Experiments. The next great celebrity chef could be discovered at The Junior Chef Experience, where children work together to bake tasty Nestle Toll House chocolate chip cookies. On Castaway Cay, the Dig at Monstro Point leads kids to discover the skeleton of a giant whale, shark teeth and other fun artifacts.